What Is Marketing Attribution, and How Can It Help Your Business? Determining how much money your business should spend on marketing is no easy task, and allocating that money properly is even more difficult. However, if you use marketing attribution, it’s possible to make informed decisions based on which of your strategies perform the best. Determining where leads and sales came from used to be nearly impossible unless you specifically asked customers how they heard about your business. Thanks to the advanced analytics available to Internet marketers, that’s no longer the case. With the right marketing attribution model, you can make better decisions regarding your strategy moving forward. In this post, I’ll discuss what exactly it is, and how you can choose the right attribution model for your business. Marketing attribution means determining which of your marketing strategies gets the credit for generating traffic and leads. The concept is as old as marketing itself, but with traditional methods, it’s difficult to do accurately. Let’s say, for example, you own a shoe store and you want to attract more customers. You put an ad in the local paper, purchase a billboard, and hang flyers in nearby public places. You spend several days and a few hundred dollars on these tactics, and when the weekend rolls around, your store is packed! Clearly, something worked. But what was it? And what should you do going forward to ensure the same results? If you knew that one your strategies was responsible for a large amount of customers, while the other two only reached a handful, the choice would be obvious. But without precise marketing attribution, it’s hard to determine what to do. Now, let’s take a look at how marketing attribution works with online strategies. How does marketing attribution work? 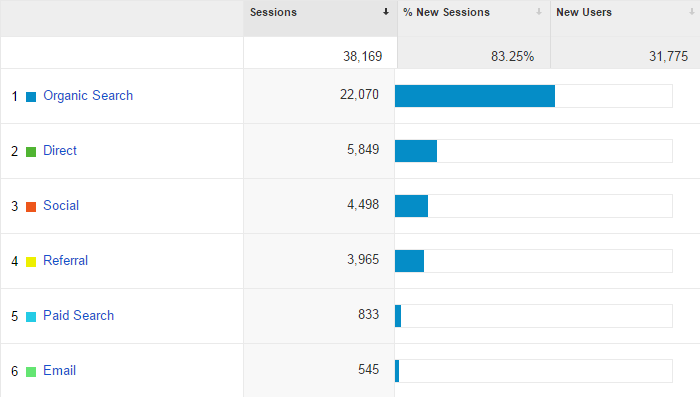 There are a few different tools you can use for marketing attribution, but in this post, I’ll stick to Google Analytics. As one of the most well-known and widely used analytics platforms today, it’s a great place to start. If you already have an account set up, determining the source of your traffic and conversions is a straightforward process. 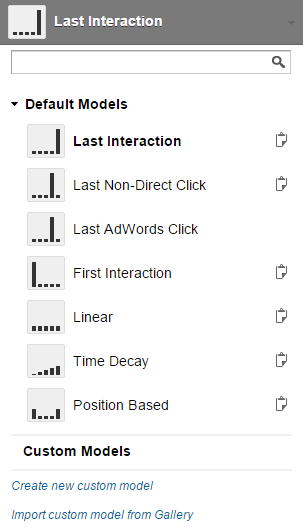 Google Analytics automatically divides your visitors into a few default categories based on how they landed on your site. Organic search refers to all of the visitors who found your site in the results of a search engine. Direct traffic is all of the users who navigated directly to your site by typing the URL. Social includes site visitors who clicked links to your site on social media. If you click “Social,” you can see a further breakdown of which social platforms (ex. Facebook, Twitter, LinkedIn) are responsible for your traffic. Referral traffic includes users who arrived on your site after clicking a link on another website. You can click “Referral” to see which sites send traffic to you. Paid search refers to the traffic your site receives from PPC campaigns. Email includes users who arrived on your site after clicking a link in one of your emails. In addition to these default channel groupings, you can also use custom campaigns to identify which of your campaigns is responsible for traffic to your site. This is useful if you have ads in many different places, or if you run frequent email campaigns, as it will help you further break down which specific content and channels are the most effective. Determining the source of your traffic is useful, but there’s another metric that matters even more: conversions. If you are able to determine where your conversions come from, you can figure out which of your campaigns not only brings visitors to your site, but also encourages them to become customers. With the last interaction model, the last touchpoint in a customer’s conversion process receives all of the credit. This means that even if a customer originally found your business on social media, signed up for your email newsletter and repeatedly clicked the links in it, but did not make a purchase until months later when they navigated directly to your site, the attribution would go to direct. If you use the last non-direct click model, all of the credit goes to the last interaction, unless it was direct. Using the scenario I described above, all of the credit would go to email. If you run AdWords campaigns, you may choose to use the last AdWords click model. This means that all of the credit goes to the last AdWords ad a customer clicked, regardless of any actions they took on your site after. In the first interaction model, all of the credit goes to the first touchpoint. In the example I described above, all of the credit would go to social media. With the linear model, each touchpoint in the process receives an equal amount of credit. In the example I described above, social media, email, and direct would all be credited with 33%. Using the time decay model, credit is divided up, but not equally. Touchpoints closest in time to the conversion receive the most credit, and first interactions receive the least. In the position based model, 40% of the credit goes to the first interaction, 40% goes to the last, and the rest is distributed evenly among all of the interactions in between. After reading through the seven attribution models available in Google Analytics, it can be difficult to determine which is the best for your business. However, you can easily switch between views, so there’s no need to choose one specific model to stick with forever. That being said, the models you choose while determining your budget depend on your goals. Are you trying to improve brand awareness? In that case, the first interaction model is useful, as it shows how visitors first found out about your company. If you’re trying to understand your sales funnel, on the other hand, the time decay model is a better choice. This will show all of the steps users take before becoming customers, and it can help you focus your efforts on the later steps. The best way to figure out which attribution models work for you, though, is just to take a look at the analytics for your own site. It’s easy for me to recommend the ones that I like, but the reason that there are so many options is that they all have a place in an Internet marketing strategy. If you have any questions about marketing attribution, or use a different method from what I described to categorize your traffic and conversions, please let me know in the comments below!